1. Tom Poti: Poti was a surprise addition to the Islanders last season. With the Isles looking for defensive aid, Poti seemed like a risk worth taking. All in all, most fans would conclude it paid off. Poti lead the team in assists (38, a career record for Poti) and was very effective on the power play early in the season. To take the pressure off Poti, Garth Snow dealt for Marc Andre Bergeron, which certainly paid off for the Isles. Wang's World is trying to keep Poti here. Poti has displayed and interest in staying. Early reports stated that the Isles were working on a multi year deal with Poti, however, later developments have speculated that the veteran will test the market. Poti is rumored to be seeking $4 million a season. The Islanders are more likely to offer Poti no more than $3.5 million for about 3 seasons. If the agreement can't be reached, New York will most likely let Poti walk and try to add a defenseman elsewhere. 2. Corey Sarich: Sarich would add depth defensively, and could be a replacement for Sean Hill. Sarich, who recently won a Stanley Cup with Tampa Bay, has expressed an interest in testing the market. He will probably move by the end of the week, seeing as other defensemen have taken up the spotlight. Sarich is a 2nd Tier defenseman, who is valued between $2.5 and $3 million per season. Rumors say that the Isles have shown an interest. 3. 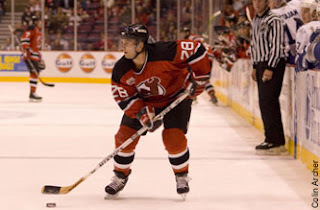 Brian Rafalski: Rafalski has been a powerful Blueliner for the New Jersey Devils for quite some time now. He has solidified himself as a power play quarterback, and someone who can really get the puck going. The Isles would consider looking at him in the event that they lose Tom Poti. They would basically be swapping out one quarterback for another. Rafalski to the Isles isn't as likely as some other free agent possibilities, but it is still something to consider. 4. Mattheiu Schneider: Much more likely to be on The Island next season than Rafalski. Th e aging Red Wing could bring something to the team that he left years ago. He is, again, a puck moving quarterback. Schneider would also add speed to the Islander blue line. He could certainly help teach some of our young, developing defenseman, and be a leader. The question is whether or not the Isles want to take the gamble and sign a 38 year old d-man at a high price. Schneider will probably get $3.5-$4 million on the market. It is also not outside the realm of possibilities that he will get even more than that. The deal will most likely be a one year commitment. This potential deal also depends on whether or not #3 returns next season. 5. Brad Stuart: A name that is certainly drawing Islander interest. Sources have speculate d that the Isles are looking to be included in the Stuart Marketplace. Stuart would add verteran leadership and would help spark a little offensive help on. An excellent puck mover that can be signed at a fair price. Wherever he lands, it'll be in the $3-$3.5 range. 6. Scott Hannan: Drawing interest from many teams in the NHL, and the Boys In the Barn ar e no exception. Hannan would add depth to the Islanders defensively, and would be one of their top penalty killers. Some have criticized Hannan's personal life off of the ice, but most teams will certainly be willing to turn their backs on that. If San Jose lands Drury, then it would be tough to also sign Hannan, who will most likely get a $4-$4.5 million per season deal. It is true that the cap has gone up, but also remember that you need to spread that cap over 20 different heads on the bench. You will need to pay Thornton, Nabakov, Marleau, Cheechoo, Drury (and would certainly like to keep them away from FA); Hannan might have played his last gave with the fins. 7. Sheldon Souray: Only to be acquired if the Isles miss out on any other big free agents. He wants at least $5 million a year, and can probably get upwards of $6 million (Thanks to Philadelphia!). Would add to the team offensively, but take away from the team attitude wise. Certainly not a leader and doesn't totally fit in with the Nolan Style of Play. 8. Roman Hamrlik: GOOD LORD?!?!? HAMRLIK?!??!? I know what you're thinking. It's just someone who has supposedly drawn interest from the team. Unlikely to return, but a name that HAS been thrown into the mix. *8 Is the least likely one here to end up in an NYI Jersey next season, but his name has been thrown around so he was included. Free Agent Forwards: Who are the Targets? First, I'll start off with the latest Smyth news. According to Spector (http://www.spectorshockey.net/rumors.html), Smyth's agent Don Meehan was on Leaf's Lunch on AM 640 CFMJ, and he claimed that Smyth will test the market. Darren Dreiger of TSN reported the same. So, although it's possible Smyth could still come back, it seems that will most likely not be the case. That said, the Islanders will have plenty of money to spend on free agents starting Sunday, and they have many holes to fill especially at all 3 forward positions. I wanted to give a run down on who sources say the team will target and who I feel the top targets should be. Danny Briere: The Sabres' co-captain last season scored 32 goals and 63 assists for 95 points in 81 games. Briere also notched 15 points in 16 playoff games. Some people might say that Briere is not as good as his numbers indicate, but I argue that he really is that good. In an injury plagued season in 05-06 where he was limited to just 48 games, Briere still amassed 58 points and left people wondering what his totals would have been if he avoided injury. Last season they got to see what he could do over a full year and he did not dissapoint. Many reports have indicated that if the Isles lost Smyth, they would offer Briere a blank check and have him fill in the spaces. That scenario could very well happen with the recent news on Smyth and the latest developments on Briere claiming he will test the market on Sunday after declining a 5 year, $25 million contract from Buffalo. Briere will get much more that $5 million on the open market, and could get as much as $8 million. As the Isles, I offer the 29 year old a 6 year deal worth between $7.3 million and $7.8 million per year. Scott Gomez: The best available playmaker on the market, Gomez could have as many as 10 teams bidding on him. Recent reports have the Flyer's zeroing in on Gomez, but the same reports say the Islanders and Rangers aren't far behind. In 72 games with New Jersey last season, Gomez had 13 goals and 47 assists. His numbers clearly indicate he is a playmaker, and he would be quite a signing for the Isles. He likes living in the tri-state area, which automatically makes both the Rangers and the Islanders suitors, as well as making a return to the devils a possibility. Many around the NHL feel that gomez would flourish in a system outside that of the Devils' continuous trap that they employ. The Isles wanted to implement a more up tempo system last year, but it didn't work as well as Nolan wanted because the speed was just not there. Replacing Yashin with Gomez automatically puts the speed there, and would go a long way in luring other players to the Island. The fact that he is only 27 means that Gomez will probably get an offer somewhere for 7 years, around 7 million. Chris Drury: Drury was co-captain with Briere on the Sabres last season. One of the best 2-way centers in the game, Chris Drury is going to be sought out by many teams looking for leadership and character along with 35+ goals. Although he isn't your typical natural goal scorer, Drury knows how to put the puck in the net. Last season, Drury had 37 goals and 32 assists for 69 points. Drury may top out at around 70 point's every year, but teams know that he has a knack for scoring when it counts. Historically, Drury has always been clutch in the playoffs and has scored some key goals over the years, his most recent being in game 5 in the Eastern Conference Semi-Finals against the Rangers when he tied the game with 7 seconds left in regulation. The Sabres went on to win in overtime and won game 6 to take the series. The Rangers have Drury up high on their list, but the Island could also be a possible sell as he is from Connecticut. On the Island, home would be just a short ferry ride away for Drury. Look for him to get around $7 million on a long term deal. Paul Kariya: With the potential loss of Jason Blake, the Islanders need to find someone to fill his shoes. In my opinion, Paul Kariya fits the bill. Kariya had two great seasons in Nashville and is expecting to test the market on Sunday. He also plays the same position as Blake. Last season he had 24 goals and 52 assists, good for 76 points. He was key in helping Nashville finish as one of the top teams in the West. In 4 out of the last 5 seasons, Kariya has played in all 82 games. He is one of the best playmaking wingers out there, and will most likely cost around $5 million. His playmaking is valuable, and might even be more valuable to the Isles if they fail to sign one of Briere or Gomez (which is very, very possible) At 32 years old, I would offer him a 2 or 3 year contract and take it from there. If I were the Isles, I would go after this guy real hard. He is definitely worth it and could very well end up here. In 05-06, he played with both Brendan Witt and Mike Sillinger in Nashville, and both of them love being on Long Island. It is possible that they sell the team enough to Kariya to persuade him to take Blake's spot. Bill Guerin: Though on the older side at 36, Guerin proved last season that he can still play. After a terrible season in Dallas, the right winger's contract was bought out and he signed on with the St. Louis Blues where he was one bright spot on a bad team. 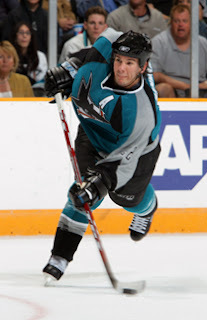 He was dealt to the Sharks at the deadline, and he had an immediate impact, scoring 8 goals in 16 games for the Sharks. Overall, Guerin Finished with 36 goals and 56 points. He could help soften the blow of loosing some of Smyth's scoring and will also be a much cheaper alternative who won't need to get signed long term. Mike Comrie: One of the youngest free agents on the market, Mike Comrie (26 years old) will be looking for a new home. The center has the potential to be a 30-30-60 guy, and has hit that a couple of times in his young career. Last season he had 20 goals and 25 assists for 45 points in 65 games with the Coyotes and the Senators. Comrie would look great on the 2nd line for many teams, especially the Islanders. He will probably get between 3-3.5 million. I offer him a 2 year contract at that amount and see what he does. He has had character issues in the past, but I am a firm believer in Nolan and really feel he can get through to Comrie. He's my option for 2nd line center. Robert Lang: The aging center had a decent year in Detroit, and it appears his best years are behind him. However, Lang can still contribute to may teams. 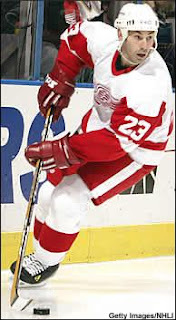 In 06-07, Lang had 19 goals and 33 assists for 52 points. He is another good option for second line center, and if Comrie slips away I would not mind him on a 1 year contract. It is worth noting that he is country mates with Satan, and should he remain an Islander Lang might be talked into coming here by Miro. Michael Peca: Yes, you read that right. The former Islander captain is again a free agent, and After 2 years off of the Island might indicate that he would like to come back. Captain Crunch enjoyed his time here except for his run ins with ex-Islander Alexei Yashin, which ultimately lead to the trade that sent Peca to Edmonton. Now with Yashin gone, it is realistic to think Peca would return, unless the shots he took at the team when Garth Snow was hired have that much of an effect on the possibility. Should he come back, it would mean Mike Sillinger would become the second line center and Peca would be the 3rd. With some good second line options available, I would rather hold off on Peca unless we really lose out on everyone. Peca might be looking for $3 million and that is very pricey for the player that he has become. He suffered through injuries last season, and only played 35 games. It will be tough for him to get that kind of money from anyone. Danius Zubrus: Many Isles fans are high on him, and have hopes the Isles will chase him. He could be a perfect fit here, but I see him as more of a 3rd line winger. My 3rd line right now would be Bergenheim-Sillinger-Hunter, and that would mean Zubrus would come as a 2nd liner. I'd rather chase after Kariya and if that fails Ladislav Nagy before I consider Zubrus as a second liner. Unless the Isles have a plan to put Bergie or Tambellini on the 2nd line, there might not be a spot for Zubrus. He has put up good numbers the past 2 years, although that is attributed to the constant scoring by Alex Ovechkin on Washington. Zubrus is one of the better defensive forwards in the league and fits the bill for a Nolan Type player, but again I just don't see him as a second liner. So that wraps up my analysis of some of the potential Isles targets for the forwards. There are only some of the key guys who the Isles have interest in or many people say they should have interest in. It is likely that the Isles land one of these players, but probably not one of the top 3 centers. My wish is to get Briere/Gomez and Kariya, but that is highly unlikely. There are plenty of options out there, so they should be able to grab some decent players if they can't grab some of the best on the market. With the cap going up to $50.3 million next season, the Isles could try and sign 2 big names if they so choose. Sean and I are going to come up with a way to cover the first day of free agency when the discussions with players can begin at midnight in Saturday. We may have a post where we constantly update who the Isles are talking to and who else is bidding against them. We'll see how we do it. Either way, we'll keep our phones on in case some of the people we know have something to tell us. Hopefully we can provide you with some great info and we can rejoice together. All we can do right now is wait and see. Until anything is officially announced and is 100% completed, everything is speculation, in regards to the Smyth Storm that took place this afternoon into this evening. 1. The terms of the contract have probably decreased in duration. 3. There could be an official press conference as early as tomorrow. 4. It will most likely be a front-loaded contract. There was a lot of speculation flowing about this afternoon. We're doing the best we can to insure that you all are provided with the most accurate information. With little information being shared at this time, the deal and the details seem to be changing at a constant rate. Hopefully within the next 24 hours, we will have a clearer understanding of what exactly took place today (if anything, which is certainly seeming to be). Hope to be sharing some good news with you all soon. Hello All. I'm excited to be a part of this blog with Chris. Keep your eyes and ears open for an Islander Webradio show, possibly coming soon. 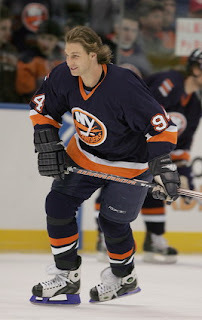 With that being said, there has been a lot of talk today about Ryan Smyth remaining a New York Islander. Sources have been talking all day long, and it sounds like a $6mil for 6/7 year deal. Supposedly, both sides are close to reaching a deal. I have been following the developments of this story for the last 4 hours. Reports have surfaced that say that Smyth's lawyers are meeting with the Isles front office. Hopefully this is a signing and not a trade. Keep in mind that Meehan and Snow were going to meet this week, and that if the Isles could get Smyth signed before Sunday, it would send a message to the rest of the league, showing them that we mean business. It would also be more appealing to other free agents who are looking to move to a new location. Just to put any fears to rest, I DO NOT use Eklund as a source. Today, he says either Smyth's signing or he's leaving....... What? Eklund is like that garbage fortune cookie you get in your take out bag. Open him up to find out that what he has to say is blatantly obvious and useless. NHL NONE-ISLANDER NEWS: Daniel Briere has declined the 5 year $25 million offer that the Buffalo Sabres offered him. It looks like Briere will test free agency. Check in for updates as this story develops. When something Islander related happens, you know where to turn for full coverage. Hi everyone, thanks for reading. This first post is going to be a bit long winded but I have a bunch of things that I want to mention. I'm still editing the site but wanted to get my first post up. There has been a lot going on in Islander Country in terms of rumors, but not a heck of a lot of actual news. I will backtrack a little bit to get us up to date. After the Islanders lost to the Sabres in 5 games in the Eastern Conference Quarter Finals, Isles fans turned their attention to planning for the off season. The first two questions that everyone wanted answered were A) Is Ryan Smyth coming back and B) Is Alexei Yashin being voted off the Island? While we still don't know the answer to the first, the answer to the second appeared to be no after reading Garth Snow's comments in a Newsday article a week or so before June. Garth basically said that Yash was here to stay, and his production would have been better if he didn't get hurt. That said, Isles fans sighed and went on with creating their New York Islander fantasy lines with Yashin included. But on June 6th, we all woke up to a surprise: Wang and the Islanders buy out Yashin for $17.6 million. While that may seem a bit pricey to tell someone to hit the road, it was a move that needed to be done. I respect Yashin and I think he is one of the gentlemen of hockey, but things just were not working out. The negatives outweighed the positives when you look at the big picture. This was Yashin's team, and it was his main job to take the team to the next level. Unfortunately that did not happen the 5 seasons he spent here and both sides agreed to move on. It was a very tough decision for Wang to make, and I'm sure it wasn't easy for the rest of the committee to make. Nolan commended Yashin for the effort he put in last year, but also said he wished "we could have gotten a bit more." Good luck to you Yash, wherever you ultimately end up. As for Ryan Smyth, well no one really knows what is going on besides the Islanders' committee, Ryan Smyth, and his agent Don Meehan. Everyone involved is keeping things very close to the vest, and rightfully so. Some fans may get upset with this idea, but it is for the better. You really don't want news like this to leak out into the media and it could create some negative press or could help give other teams clues as to whether or not Smyth is available on July 1st. I will get more into this as we get closer to Sunday. Also of note, the Islanders re-signed last minute hero Wade Dubielewicz to a 1 year, 1 way contract for $500K. Dubie came a long way since he got his first look back in the 2003-04 season, and finally earned the backup job, or at least for the next year. I look forward to the DP-Dubie combo next season. Another good signing was getting Sean Bergenheim for 1 year at $500K. Bergenheim and the Isles had a dispute before last season, which ultimately led to Bergie going to Russia to play. He later moved on to a team in Sweden. The Isles and Sean made amends and Sean is set to prove himself next season. I hope to see Sean play on a line with Mike Sillinger and possible Trent Hunter. I think that could be a very exciting line. Other than that, the rest are rumors of who is coming or who is going. I am still trying to sort through all the news that has been flying around since the end of the season. I will talk more about free agency in my next post.